Smoktech continued to build off of their successful TFV platform, evolving into something that could only be described as “tremendous” for the cloud chasers around the globe. 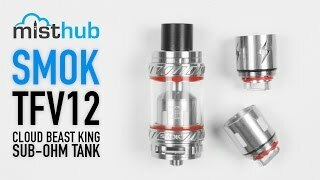 The SMOK TFV12 Cloud Beast King sub-ohm tank is a true marvel of engineering, dramatically increasing vapor production from the already impressive TFV8 Cloud Beast tank. The massive TFV12 measures at 70mm tall & 28mm wide and is constructed out of Stainless Steel and Pyrex Glass, featuring a heat-resistant 510 wide-bore Delrin drip tip and Smok’s notorious top-fill swivel cap that makes filling this tank fast and painless. Due to its massive size, the Cloud Beast King offers a significant increase in airflow potential when compared to the TFV8 Cloud Beast, providing two massive airflow channels that can be opened/closed via airflow control ring at the base of the tank. Most impressively, the Cloud Beast King is compatible with an extensive line of pre-built TFV12 atomizer heads as well as two separate RBA decks (not included). Included with this tank is a 0.12 ohm V12-T12 Duodenary coil head pre-installed, a 0.15 ohm V12-X4 Quad coil head, and a second 0.15 ohm V12-Q4 Quad coil atomizer head. These atomizer heads cover a vast range of wattage, effectively firing as low as 60W while maintaining its trademark epic flavor at wattages as high as 350W! All of SmokTech’s TFV12 replacement atomizer heads are constructed out of high-grade Stainless Steel and are wicked with Pure Organic Cotton to produce that unforgettable flavor. Smok TFV12 Cloud Beast King is by far the most powerful tank in SmokTech’s arsenal, combining high-wattage potential with Smok’s superior flavor output. If you’ve been a fan of the TFV platform, looking for a tank that has an extensive catalogue of different coils to try out, or are just looking to impress your friends with some massive clouds, SmokTech’s latest TFV12 Cloud Beast King will not let you down! From day one, SMOKTech has been known by the vape community as one of the leading vaping manufacturers on the scene, consistently producing high-quality tanks and vaporizers that easily stand out among the crowd. Having introduced their most prized and successful “Taste Furious V4” platform in August of 2016, SMOK set out to produce high-quality sub-ohm tanks that were equally capable of creating record-breaking clouds that produced an unforgettably rich taste and intense flavor. To this day, the legendary SMOK TFV platform is considered to have produced the most powerful, consumer-friendly tanks on the market today- only to be rivaled by rebuildable atomizers that rely on the consumer’s advanced skill-set to build the coils. With their extraordinary ability to pay close attention to the details, while constantly evolving and delivering vape devices and tanks that vapers are looking for, it’s no surprise that SMOK TFV12 Cloud Beast King Sub-Ohm Tank is truly a marvel of modern vape engineering. As the most powerful tank on the TFV platform, the TFV12 Cloud Beast King is fully capable of accommodating the vape industries’ first-ever pre-wrapped duodenary atomizer head, boasting 12 high-powered coils in a single head for your overpowered all-day-vaping pleasure. SMOK TFV12 Cloud Beast King wasn’t crowned King due to its remarkable flavor or vapor production alone; the overall construction of the TFV12 is a sight to behold, presenting its meticulously crafted body with visually appealing machine-cut grooves and contemporary lines that add to the tank’s pleasing aesthetics. The top cap and base are equipped with angular ridges that give the Cloud Beast King an appealing allure, visually setting this tank apart from the previous TFV8 Cloud Beast in remarkable fashion. Whether you prefer Stainless Steel, Black, Gold or a multi-colored variations when it comes to your tanks, SMOKTech has got you covered with each color to make sure your new setup is nothing short of spectacular. Similar to the previous tanks released on the TFV platform, the frame, body and internal components of the TFV12 Cloud Beast King are constructed out of high-quality, rust-resistant Food Grade 304 Stainless Steel. This reliable combination of Nickel, Chromium and Steel (with trace amounts of Carbon) lay the groundwork for the solid chassis of the Cloud Beast King, and is dual-coated in weather-resistant paint to provide further protection from the elements while adding to the Cloud Beast King’s appealing new look. The SMOKTech TFV12 Cloud Beast King is equipped with a heat-resistant Delrin drip tip that features a wide construction to increase airflow and help produce those massive, thick plumes of vapor. This new heat-resistant vaping technology enables the user to vape consistently at high wattages without the fear of burning their mouth or lips due to a rise in the tank’s external temperature. The massive 6mL e-juice reservoir is carefully crafted with an incredibly durable Pyrex glass. Pyrex glass lends a unique advantage over plastic, as Pyrex significantly increases the lifespan of the tank due to its anti-acidic properties and heavy-duty construction. These minor details bring out the full-flavor of your favorite e-juices’, providing a cleaner, safer, and overall more enjoyable vaping experience while maintaining the TFV12’s beautiful appearance over time. Mouth-to-lung vapers and Direct-to-lung vapers will get to experience the full-flavor of this high-powered tank thanks to the adjustable dual-airflow control ring that’s constructed into the base of the TFV12 Cloud Beast King. The spinning adjustable airflow control collar can be turned clockwise/counter-clockwise, effectively allowing more air/less air to travel through the two massive airflow channels and into the chimney of the TFV12 Cloud Beast King, thus creating a more restricted/less restricted draw depending on the vapers’ exact preferences. The two air-flow channels on the TFV12 Cloud Beast King feature a 30% increase in size when compared to the previous TFV8 Cloud Best, providing the user with never-before-seen levels of airflow and airflow control. Building off the previous success of other TFV top-filling tanks, the TFV12 Cloud Beast King is equipped with Smok’s patented TFV-series top-fill swivel cap. This revolutionary top-filling system has remained the same throughout all of Smok’s TFV tanks, providing what is quite possibly the most intuitive and innovative design for top-filling tanks. 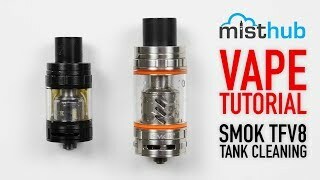 Unlike the traditional tank construction where the user must first remove the tank from the mod and disassemble the tank completely in order to fill the tank, the TFV12 Cloud Beast King is equipped with Smok’s proprietary top-fill swivel cap. This revolutionary design enables the user to fill the tank with a simple twist of the top-cap. With the top cap open, a single e-juice fill port is revealed and the user can fill the TFV12 Cloud Beast King quickly and painlessly without having to remove the tank from the mod or disassemble the tank. 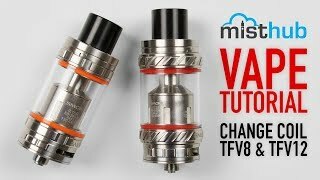 While the TFV12 Cloud Beast King appears to be in a world of its own in regard to construction quality, design elements, attention to detail and expert craftsmanship, these remarkable features could be overlooked by vapers due to SMOK's crowning achievement in the Duodenary atomizer head. Most impressively, the Cloud Beast King wouldn’t be the King without its long line of impressive atomizer heads that operate with it. While the TFV12 Cloud Beast King appears to be in a world of its own in regard to construction quality, design elements, attention to detail and expert craftsmanship, what truly sets this tank apart from the rest is the long list of atomizer coils that operate with it. For the first time in mans’ entire history, vapers can harness the power of Smok’s mind-blowing 0.12 ohm Duodenary atomizer head that features 12 individual coils working in unison to bring you never-before-seen amounts of cloud production and a flavor experience that’s straight-up out of this world. This remarkable feat of vape engineering is wicked with 100% Pure Organic Cotton and is completely free of any contaminate impurities to provide the cleanest and most pure vaping experience possible. The incredible V12-T12 Duodenary atomizer head is Smok’s most powerful coil head ever created, as well as the industries’ most powerful consumer-grade atomizer head, and is compatible with wattages that range from as low as 60W and capable of handling wattages as high as 350W. 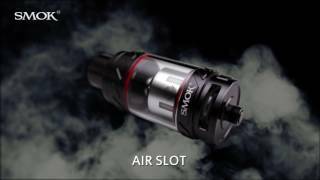 Furthermore, Smok includes three additional replacement atomizer heads in the box with the TFV12 Cloud Beast King. For the vast majority of vapers that do not enjoy vaping with pre-made atomizer heads, SMOKTech has engineered a separate RBA-T deck (sold separately) that works exclusively with the TFV12 Cloud Beast King. Smok’s RBA-T atomizer head can be used in place of the pre-installed coil heads, providing complete control and customizability to the skilled-user and allowing them to create endless combinations of virtually endless builds for their all day vaping pleasure. The impressive RBA-T head promotes a three coil alignment and was designed to accommodate triple coil builds, effectively making the RBA-T atomizer head SMOK's most powerful RBA deck and providing endless hours of building fun for the skilled vapers to enjoy creating complex and intricate builds. SMOKTech’s TFV12 Cloud Beast King will undoubtedly go in the history books as one of the most innovative and jaw-dropping atomizers of 2017. If you’re looking for a massive 6mL tank that’ll give any RBA or RDA a run for its money, the TFV12 Cloud Beast King will bring you a fog machine that’s quite unlike any other!